Heidezicht is an unique settled Bed & Breakfast in the nature-area Veluwe in The Netherlands near the small village Elspeet (Gelderland). 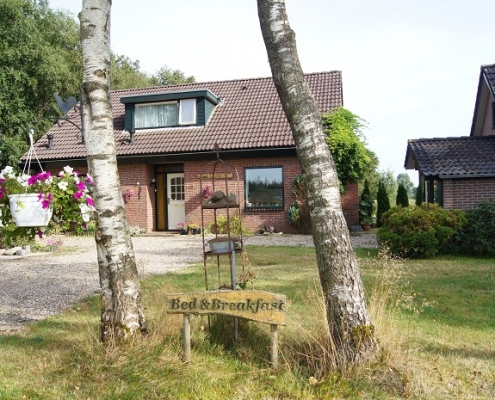 You can explore the area and walk through forest and heath from this very restful Bed & Breakfast. The Veluwe is famous for her beautiful nature and good opportunities for walking tours, cycling tours and horse riding. On the same premises as the Bed & Breakfast we have a cosy holiday home available. It is located at a quiet sandy road with a magnificent view over the heath. From time to time, a flock of sheep grazes the moor. Sometimes deer and foxes are passing. An ideal place to enjoy a restful holiday in nature. In August-September the heath is purple colored. Heidezicht is located in the nature-area Veluwe in The Netherlands near the rural village of Elspeet (Gelderland). It is close to the National Park Hoge Veluwe (with the famous Kroller-Moller Museum and its collection of Vincent van Gogh paintings) and old harbour towns of Harderwijk and Elburg.